Apparently RENNtech has snagged themselves some genius advertising folks, because they sent us some pictures of their new and hugemongous 16.2" cross drilled and vented two piece front rotors - along with a P-shopped image of a Dominos Pizza for reference. The combination of breathtakingly huge rotors squeezed by eight piston calipers and delicious pizza is a fantastic idea, assuming the pads are asbestos free. For formality sake, they lose points for not displaying the actual Dominos Brooklyn-style pizza which is apparently two inches smaller than the $7,995 brakes. For those interested in brakes able to stop the planets' rotation, these can be fitted to any of the Mercedes Benz products RENNTech works with, and we bet they'll throw in that pie with the deal. 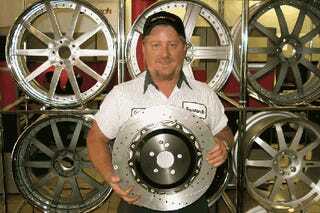 Lake Park, FL - 29APR2008 - RENNTECH 16.2" Brake PKG for Mercedes-Benz Sixteen-point-two inches. At 16.2", RENNTECH's new front rotors are more than two inches larger than a Domino's Brooklyn-style pizza, and more than three inches larger than the stock rotors on Mercedes' 382 hp SL550 roadster. Founded in 1989 by ex-AMG technical director Hartmut Feyhl, South-Florida tuning firm RENNTECH built its reputation on a solid foundation of expert engine-building and superb braking systems that turned 100-0 mph panic stops into predictable, fade-free non-events. "As soon as we start building significant horsepower into these cars, we have to upgrade the brakes," says Feyhl. "My customers are concerned with usable performance, especially real-world performance - and proper brakes have always been a part of that equation." RENNTECH's latest brake package is no exception - originally developed as a real-world upgrade for the exotic SLR McLaren, the big 16.2" rotors are now available on RENNTECH's full line of tuned S, CL, CLS, and E class Mercedes /AMG cars. RENNTECH's 16.2" brake upgrade features lightweight 2-part drilled and slotted front rotors, 8-piston RENNTECH calipers, stainless steel braided lines, and high-performance pads and fluid. For extreme performance applications, RENNTECH offers 14.2" rear 2-part rotors with 4-piston calipers. Prices start at 7,995 USD - contact RENNTECH for more information.